Model Thunder3 10G Network Adapter Part No. 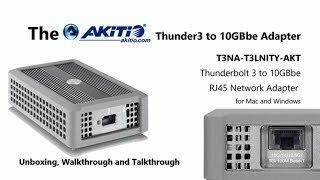 T3NA-T3LNITY-AKT Certifications CE FCC VCCI RCM BSMI Thunderbolt Warranty 2-year limited warranty Case material High quality aluminum for optimized heat dissipation Interface/Ports 1 x Thunderbolt™ 3 (USB-C) port 1 x RJ45 Ethernet port compatible with 10G/5G/2.5G/1G/100M Base-T Data transfer Thunderbolt 3 up to 40Gbps Ethernet port supports auto-negotiation for 10Gb/s, 5Gb/s, 2.5Gb/s, 1Gb/s and 100Mb/s System requirements (PC) Windows 7 (64-bit), Windows 10 (64-bit) Computer with Thunderbolt™ 3 port 10G Ethernet driver must be installed for the device to function properly System requirements (Mac) macOS 10.12.5 and later Computer with Thunderbolt™ 3 port 10G Ethernet driver must be installed for the device to function properly System environment Operating Temperature: 5°C ~ 35°C Storage Temperature: -20°C ~ 60°C Relative Humidity: 5% ~ 95% (non-condensing) Power supply N/A (bus powered) Dimensions (LxWxH) 4.96 inches x 3.15 inches x 1.5 inches 12.6cm x 8cm x 3.7cm Package contents Thunder3 10G Network Adapter Thunderbolt 3 cable (50cm) Setup guide Carton/Packing Retail Box Size: 6.3 x 5 x 1.9 in. (16.1 x 12.6 x 4.8 cm) Carton Size (20pcs per carton): 21.4 x 10.9 x 7.4 in. (54.3 x 27.7 x 18.7 cm) Remarks This Thunderbolt product is not compatible with Apple's Boot Camp. High quality Cat-6A Ethernet cable is recommended for distances up to 100m. At shorter cable length, it's possible to use cables of lower grade (e.g. Cat-6 for 10G or Cat-5e for 5G up to 55m). This device does not support boot from network or Wake-on-LAN (WoL). This device cannot be used on older Thunderbolt and Thunderbolt 2 computers. This product has components or design elements that are patented or patent pending. Can I use this with a Thunderbolt 2 adaptor and still get 10g speeds? You would need an adapter that allows "Bus Power" as the Akitio is "Bus Powered" and will not work properly. You can still link aggregate the 453A which will improve your bandwidth? Looking forward to this - this is very affordable 10GBe upgrade for my MAC - video editing here i come!